MPs have voted to reform the House of Lords by demanding all members are elected, rather than appointed. There was a majority of 113 in favour of this proposal. MPs, allowed more than one choice, also voted by a majority of 38 for 80% of members of a reformed second chamber being elected and the rest appointed. The decisions will not pass into law but are expected to inform government plans. Commons leader Jack Straw called the votes "a historic step forward". Mr Straw had put forward nine options, with the rest rejected by MPs. He pledged to bring a cross-party group together to discuss the next stage of reform. Prime Minister Tony Blair voted in favour of a 50/50 split between elected and appointed members - also Mr Straw's preferred choice - but not for any other proposal. Mr Straw told the BBC that MPs' decisions represented a "pretty seismic shift", saying : "The message was a very decisive and clear one in favour of reform of the existing House of Lords." He added: "This is the first time there's been a clear view on this for 98 years, so it's progress. "I mean business, so does the government and so, I think, do the other parties." The votes follow two days of debate in the Commons. Shadow Commons leader Theresa May said: "The House of Commons has clearly expressed a preference for a substantially or wholly elected House of Lords. "But this is only a first step and indeed it raises further questions. Given the tactical voting tonight we now need to establish what the House of Commons' settled view is." Liberal Democrat leader Sir Menzies Campbell said: "This is a truly historic occasion. "After nearly 100 years the House of Commons has at last taken the momentous step to reform the upper house and make it fit for a modern democracy. "This is a famous victory for progressive opinion both in Parliament and in the country." 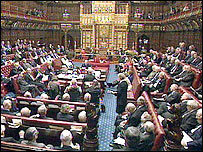 The last time the Commons voted on Lords reform, in 2003, all options were rejected. At the moment all peers are appointed, apart from the 92 hereditary peers who survived the first phase of Lords reform during Tony Blair's first term in office. In another vote, MPs decided by a majority of 280 to remove the remaining hereditaries. The Scottish National Party's chief whip, Pete Wishart, said: "Party patronage is now at an end and that can only be good for our democracy." The House of Lords debates the reform proposals next week. Labour peer Lord Lipsey has published figures suggesting £1,092m as the cost for the proposed shake-up. He said he used official figures and plausible assumptions to reach the estimate, but a government source dismissed that figure as based on "back-of-an-envelope calculations".